St Magnus Church a 12th Century round towered Viking church one of only a few still in existence, dominates the skyline of Egilsay. On a clear day St Magnus church can easily be seen from the Orkney mainland. Egilsay is the place where Magnus was betrayed and forced to bargain for his life before Hakon (his cousin) ordered a servant to kill him with a single axe blow to the head. In 1937 the association between St Magnus Cathedral, Kirkwall and St. Magnus the Martyr by London Bridge was more firmly cemented by the last rector, the Reverend Henry Joy Fynes-Clinton, who with two members of his congregation travelled to Kirkwall in July of that year, to be present at the 800th anniversary celebrations of St Magnus in the Royal Burgh of Kirkwall. 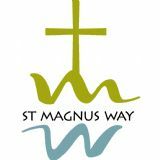 During their stay they visited Egilsay and were shown the spot where St. Magnus had been slain. 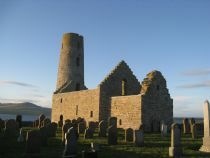 Later the Reverend Fynes-Clinton was present at a service held at the roofless church of St. Magnus on Egilsay, where he suggested to his host, Mr Fryer, the minister of the Cathedral that the congregation of Kirkwall and London should unite to erect a permanent stone memorial on the traditional site where Earl Magnus had been so savagely murdered. In 1938 a Cairn was built of local stone on Egilsay. It stands 12 feet high and is 6 feet broad at its base. The memorial was dedicated on 7th September 1938 and a bronze inscription on the monument reads, ‘erected by the Rector and Congregation of St. Magnus the Martyr by London Bridge and the Minister and Congregation of St. Magnus Cathedral, Kirkwall to commemorate the traditional spot where Earl Magnus was slain, AD circa 1116 and to commemorate the Octocentenary of St Magnus Cathedral 1937’. This Historic Scotland listed building (November 1995) formerly bore the arms of and initials of Robert Monteith and Katherine Nisbet dated 1635. As part of the Bishopric estate the whole of Egilsay was feued to the Monteith family in the 16th Century. 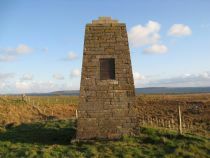 On the marriage of Marjorie Monteith to William Douglas, Chamberlain of Orkney, commemorated in the initialled skewputt, the island passed to the Douglas family. Howan has recently been bought and is currently undergoing renovation by its new owners. If you are coming over as part of a small group give us a call and fair notice and we will arrange to open up the community hall and provide light refreshments for a donation to our Community Association funds.